Tom Barlow scored a hat trick for the New York Red Bulls II after coming on as a second-half substitute to earn his side a point in a 4-4 draw with the Charleston Battery at MUSC Health Stadium. The Battery took the lead in the 22nd minute when Ataulla Guerra finished off a quick move upfield with a lifted finish. The Battery doubled their lead in the 28th minute on a diving header by Patrick Okonkwo from Nico Rittmeyer's back-post cross from the right. Guerra struck in first-half stoppage time to make it a three-goal lead for the hosts at the break. The Battery were reduced to 10 men in the 61st minute as Tah Anunga was sent off after a foul on Steven Echeverria. 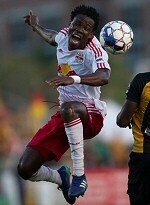 The Red Bulls II pulled a goal back three minutes later from the penalty spot as Barlow scored after a handball by Battery defender Jay Bolt. New York struck again in the 68th minute as Jose Aguinaga flicked home a low finish from Jared Stroud's cross from the left. Barlow scored his second five minutes later as he headed home at the near post from Allan Yanes' cross. The Battery immediately regained the lead, as Okonkwo scored his second of the night with a headed finish from Vincenzo Candela's corner kick from the left. Barlow finished off his hat trick with two minutes to go as his looping header found the left corner of the net to leave the game level.